Very simple to use, bright 2.8” screen makes it easy to read and navigation is straightforward. Is your Mercedes Benz giving you the pesky “check engine” light or telling you something is wrong? Don’t wait until a disaster happens, use a diagnostic scanner to identify the error and fix it before it becomes a problem. No more CEL staring you in the face or worrying about a system failure in your precious Benz! If you’re looking to maintain your own Mercedes but don’t want to have to buy a separate tool for your other cars as well, consider the versatile Creator c502. The Creator c502 is a specialty device for Mercedes Benz owners who want to ensure that their vehicle is working correctly at all times. 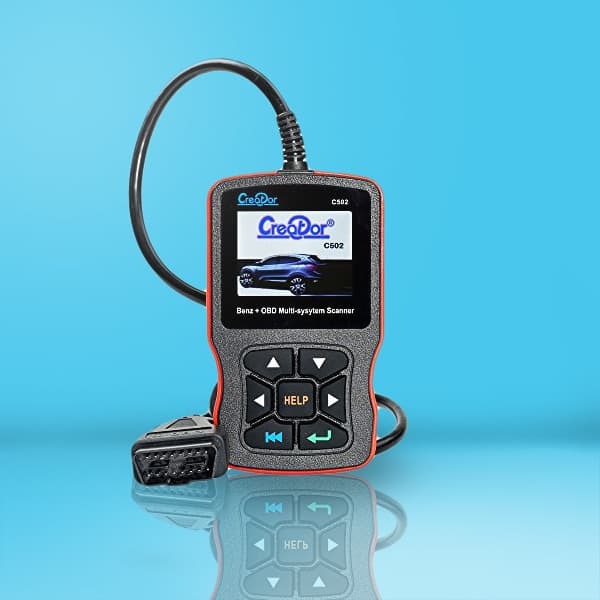 It can scan the engine of just about any ODBII-compliant car, identifying and clearing any “check engine” lights or other error codes. In addition to engine scanning, the device can scan the braking, airbag, transmission, and other systems of Mercedes Benz cars just as easily with a live display feed being fed from the car to the screen. The compact device is simple to use, with directional buttons and clear user interface allowing just about anyone to use it confidently. Simply plug it into the port in your car to power it on and choose your scan. 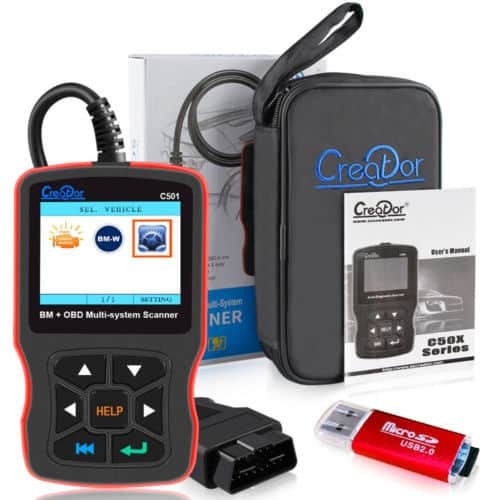 The Creator c502 would be best suited for a small shop that sees a number of Mercedes Benz or a DIYer who owns a Mercedes Benz and wants as much information as possible. It allows you to perform a number of diagnostic scans quickly and easily, making it beginner-friendly but still comprehensive enough to get a solid idea of the car’s status. The advanced functionality only applies to the Mercedes Benz models, so if you don’t have one, there are likely better options. The Creator c502 includes the device itself with the 16-pin connector attached to the top. The package also comes with a carrying case to hold it, an SD card and USB reader so it can be updated, and the user manual. The Creator c502 is a beginner-friendly, cost-effective, and simple but effective diagnostic scanner. It has a 2.8” display screen that makes it easy to read any diagnostic information the device returns to the screen from your car or truck. It also refreshes the display with a live data stream after a scan so that you don’t have to rescan every time you try a fix and takes a snapshot of your engine data to help you diagnose problems without recreating them. The scanner itself can read and clear error codes and CELs from the engine of any ODBII-compliant vehicle. For Mercedes Benz vehicles, it can diagnose the airbags, brakes, electronics, air conditioning, emissions, and more with ease. These specialty codes for Mercedes Benz require a specific device to read and translate directly, and the c502 does just that. You can update your c502 by updating the SD card with the micro USB reader that is included, allowing you to use it for years to come, even with newer models of Mercedes Benz. When it comes to car scanners for Mercedes Benz, the Creator c502 is near the top of the list. It does just about everything the standard car owner would want, and even has professional-level functionality because it can test multiple systems with just a single device. While the functionality suffers on non-Mercedes Benz models, it still performs basic engine scans to make it useful for those who have a Mercedes Benz and other models. With the c502, there’s no need to buy 2 devices for your garage.